On October 9, 2016 February 17, 2018 By felicitousfelixIn Are There Lesbians? Raised in a house of thieves, Sue Trinder is swayed into helping “Gentleman” trick young heiress Maud Lilly out of both her sanity and fortune. Only things aren’t quite what they seem in this gothic tragicomedy of errors. I loved this book so much. My goodness I am starting so many reviews with that sentence. But you can trust me that it is all true – I wouldn’t say it if I didn’t! I read Fingersmith in anticipation of eventually watching The Handmaiden, so we shall see how long it takes me to get around to doing that. Of course you can then expect another review. Luckily, this was pretty much my only problem with the novel. Distressing as it was to spend almost literally the entire book waiting for Sue and Maud to finally say they liked each other; it is understandable why they didn’t – especially when they were playing one another and trying not to get feelings hurt. I do still feel like if they had talked things over earlier they could have joined forces and overcome the various tribulations that happen to them later in the novel, but then we wouldn’t have had much of a story, and we wouldn’t get our final revelation. It’s annoying, but I can accept it for the sake of a killer plot with as many twists and turns as a twisty turny thing. 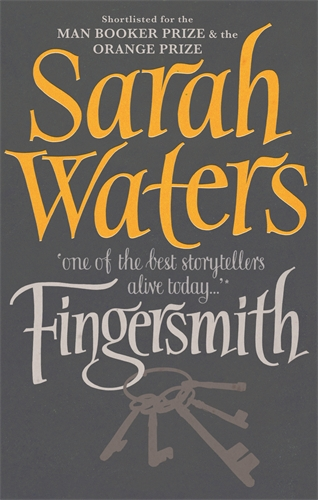 As always, Sarah Waters has written a fantastic cast of women to fill her Victorian London (and surrounding environs). Each is superbly different from the last, and each both strong and fragile in their own ways. They all have flaws and they all feel human, even if they do also feel heartless at times. The three parts are told from alternating points of view – Sue, then Maud, then back to Sue, and you only know as much as each of these characters at any given time. So when surprises come they are truly a surprise. I found Fingersmith to be the easiest read of her works – I absolutely powered through it. The plot is gripping and suspenseful, making full use of gothic tropes to my extreme delight. There are crumbling old mansions, madhouses, secret marriages and best of all, secret plots. What I’m saying her is really, if you like lesbians and gothic literature, and if you especially like it when the gothic literature involves lesbians who end up happily ever after, then Fingersmith is definitely the book for you.